“The Gray Ghost of Gonzaga” was an All-West Coast and Little All-American selection in college for his play at halfback. He was chosen by the Packers in the seventh round of the 1941 NFL draft and backed up Cecil Isbell at tailback. His statistical totals were thus modest during his first two seasons as he rushed for a total of 409 yards, caught 10 passes for 66 yards, passed for 364 yards and five touchdowns, and returned 10 kickoffs for a 24.7-yard average and 11 punts for an average of 9.3 yards, and scored six TDs. Canadeo made up for lack of ideal size and speed with determination, savvy, and versatility. With the departure of Isbell, he saw more action in 1943 in combination with rookie Irv Comp. Packers went 7-2-1 to finish second in the NFL Western Division. 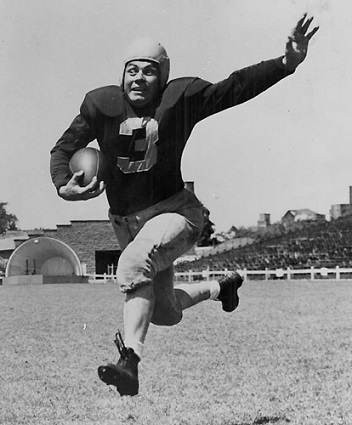 Canadeo was with the Packers for three games in 1944 before leaving for World War II military duty. Upon his return to the team in ’46, he was utilized more as a halfback. He led Green Bay in rushing for four straight seasons, receiving second-team All-NFL honors from UPI and Pro Football Illustrated in 1948 and first-team recognition from UPI and INS in ’49, a year in which he ran for 1052 yards, becoming the third player in NFL history to cross the thousand-yard rushing threshold and the first to do so without leading the league. Canadeo’s ground-gaining totals dropped off thereafter as HB Billy Grimes took over more of the rushing duties, but he averaged 25.7 yards on a career-high 16 kickoff returns in 1950 and set another high in ’51 with 22 pass receptions for 226 yards. His career, spent entirely with the Packers, finally ended after the 1952 season. Overall, he rushed for a then-team record 4197 yards on 1025 carries (4.1 avg.) with 26 TDs, caught 69 passes for 579 yards and five scores, passed for 1642 yards and 16 touchdowns, returned 46 punts for an 11.2-yard average and averaged 23.1 yards on 75 kickoff returns, and intercepted 9 passes on defense. He scored a total of 31 touchdowns. Canadeo remained active with the Packers following his retirement, as a broadcaster and also a member of the team’s board of directors. The club retired his #3 and he was inducted into the Pro Football Hall of Fame, Class of 1974.